AbFrontier has also developed a sensitive and economical ECL reagent, WestSave Gold and WestSave Up, for Western blotting. Furthermore, the company has produced several of the first oxidation-specific antibodies in the world, as an indication of its innovative power and expertise. Reactive oxygen species (ROS) include oxygen ions, free radicals, and peroxides, both inorganic and organic. ROS form as natural byproducts of oxygen metabolism and have important roles in cell signaling. However, they are highly reactive due to the presence of unpaired electrons and can be very harmful. Damaged DNA, enzymes, fatty acids, and cofactors cause destruction of normal cellular functions. During times of environmental stress, ROS levels can increase dramatically, which can result in significant damage to cellular function. Reactive oxygen species are implicated in oxidative stress, aging, cardiovascular diseases, neurodegenerative diseases, and cancer. 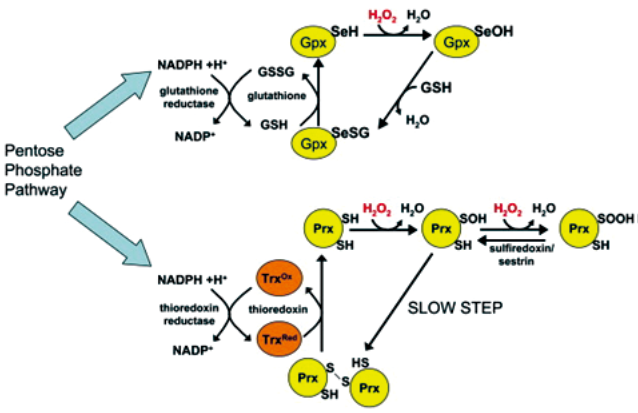 Hydrogen peroxide (H2O2) removing pathways by Gpx (Glutathione peroxidase) and Prx (Peroxiredoxin). Find these and more at Axxora!